On a phone booth in Manchester, England — where I now live as a transmigrant — I saw an advertisement that read: ‘Send money home from closer to home.’ It went on to announce that you can send funds to locations around the world from any British Post Office. The Post Office, whose sales operations have now been privatized, has joined businesses around the world that seek to profit from migrant remittances. Spanish banks extend mortgages to migrants living in Spain who are building houses ‘back home’ in Ecuador and elsewhere in Latin America, while appliance stores in Brazil process orders for customers whose source of payment comes from family members living abroad (Lapper, 2007a). Migrants’ money transfers, purchases of costly commodities, and homeland investments figure large in the recent policies of powerful globe-spanning financial institutions, such as the World Bank, which have proclaimed migrant remitters as the new agents of international development (De Haas, 2007; Fajnzylber and Humberto Lôpez, 2008; Lapper, 2007b; World Bank, 2006). 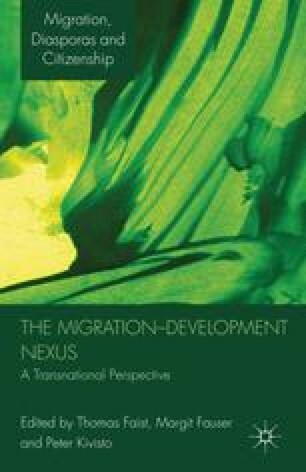 Meanwhile, researchers of development and migration, while noting the possibilities and contradictions of migrant remittances on sending and receiving localities, take for granted that migrants are both local and transnational actors (Faist, 2008; Fauser, Chapter 6 in this volume). Yet at the same time that the transnationality of migrants is being both routinely documented and celebrated, politicians and the mass media in Europe and the United States are focusing their concern primarily on questions of ‘integration’, portraying migrants’ transnational ties as threats to ‘national security’. This article appeared originally in Social Analysis, 53 (3), Winter 2009, pp. 14–37. It has been slightly revised thanks to suggestions from Thomas Faist and Gudrun Lachenmann.